Lord, in your kindness hear our petitions. You called Andrew the apostle to preach the gospel and guide your Church in faith. May he always be our friend in your presence to help us with his prayers. We ask this through our Lord Jesus Christ, Your Son, who lives and reigns with You and the Holy Spirit. Amen. 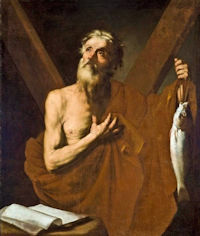 St. Andrew was a native of Bethsaida in Galilee, a fisherman by trade, and a former disciple of John the Baptist. He was the one who introduced his brother Peter to Jesus, saying, "We have found the Messiah." Overshadowed henceforth by his brother, Andrew nevertheless appears again in the Gospels as introducing souls to Christ. After Pentecost, Andrew took up the apostolate on a much wider scale, and is said to have been martyred at Patras in southern Greece on a cross which was in the form of an "X". This type of cross has long been known as "St. Andrew's cross." Patron: Achaia; Amalfi, Italy; anglers; Burgundy; diocese of Constantinople; fish dealers; fish mongers; fishermen; gout; Greece; Lampertheim; Germany; maidens; old maids; Patras, Greece; Russia; Scotland; singers; sore throats; spinsters; University of Patras; unmarried women; women who wish to become mothers. Symbols: Fish; Saint Andrew's cross; Cross saltire (x-shaped); V or Y shaped cross; two fishes; tall cross and book; vertical spear; primitive fish hook; fisherman's net. Often Portrayed As: Man bound to a cross; man preaching from a cross; preacher holding some fish. Because weddings were not allowed during Advent and Christmas and Andrew is the patron of unmarried maidens, many countries have marriage-related superstitions connected to this day. See Patron Saints Index for a few traditions. Beginning today the Christmas Anticipatory Prayer, also known as the "Novena to St. Andrew" (Hail and Blessed be the hour...) is prayed every day until Christmas. Read Anticipating Christmas, Beginning with the Saint Andrew. View some of the art depictions of St. Andrew. Here's another Gallery of Images of Andrew. Remember to pray for fishermen and all who make their livelihood by the sea. Andrew is the patron saint of Scotland, Russia, and Romania. The flag of Scotland (and the Union Flag and the arms and Flag of Nova Scotia) feature a saltire (X-shaped cross) in commemoration of the shape of St. Andrew's cross. Read more about St. Andrew from Butler's Lives of the Saints. Also read about Andrew from The Golden Legend. Scotland: St. Andrew is the patron of Scotland. Scones, haggis, sheepshead and fish dishes are traditional. The scones are called "wigs", although their shape is rectangular. England: St Andrew is a patron of lace-makers. On his feast, sometimes known as "Tander", areas such as Bedfordshire, Buckinghamshire, Hertfordshire and Northamptonshire celebrate by feasting, drinking elderberry wine, sports and serving a special cake called the Tandra Cake, particularly in Bedfordshire. It has a bread dough base to which lard, sugar, currants, lemon peel and eggs are added. This is also a day for squirrel hunting in England, so Brunswick Stew would be another dish on the table in England. Slovakian Countries: Halushky (pasta dish) is cooked. Unmarried girls place slips of paper with names of single young men into the dish.